It’s a clear no-brainer (ahem!) for SkeletonPete to LOVE Popular Skullture a new book from Dark Horse Comics’ Kitchen Sink imprint. Set for release on November 5, 2014 – just a smidgen past Halloween and Dia De Los Muertes – this compendium packs scads of illustrations of creepy crania between its covers. 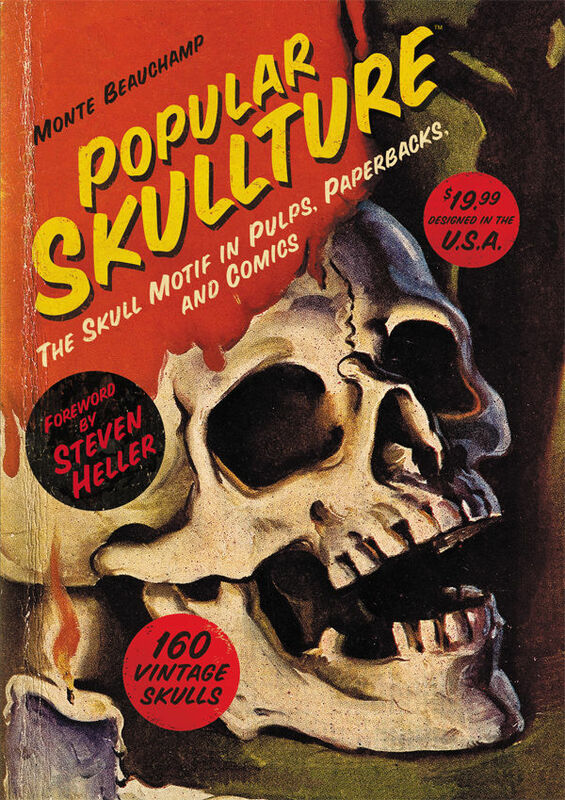 Steven Heller’s introduction tracks the historical context of skull imagery and Editor Monte Beauchamp’s preface recounts the genesis of the project. Beauchamp also gives readers a study of each style of book (comics, pulps and paperbacks) the images are derived from. He lists publishers, publication dates, and artists where they are known. The book is a fun visual roller-coaster with dozens of artists works from 1930’s-1950’s represented. The cover styles run from the subtle to gobsmacking. It’s particularly interesting to see covers from early 1950’s EC comics competitors like Farrell Publications, Superior,AGC and others. One can imagine newsstands filled with these lurid enticements as the catalyst for government pressure and the ultimate formation the comics industry’s self regulatory code. 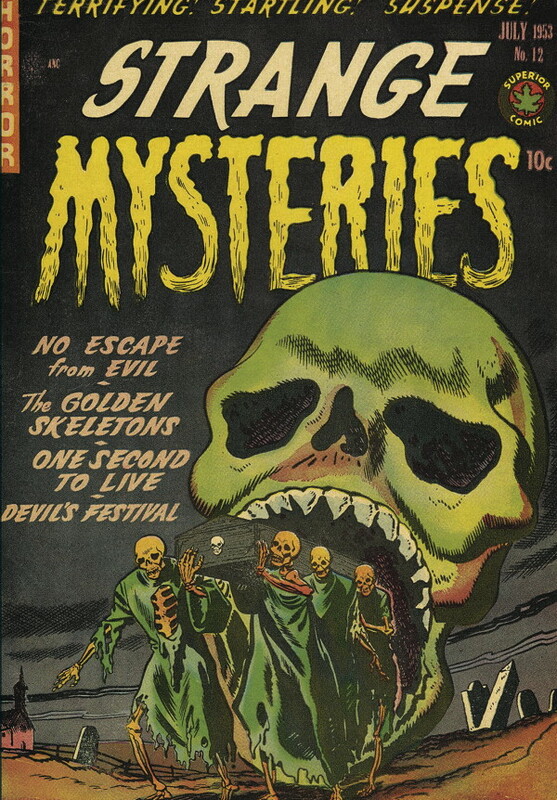 We encounter a skull faced Cleopatra on the cover of VooDoo #8 (April 1953), Haunted Thrills #6 sports a top hat wearing skull tossing “snake-eyes” on a pair of dice (right up my alley), while another favorite, Superior’s Strange Mysteries #12 (July 1953), features pallbearer skeletons dragging a coffin from the mouth of a gigantic skull. 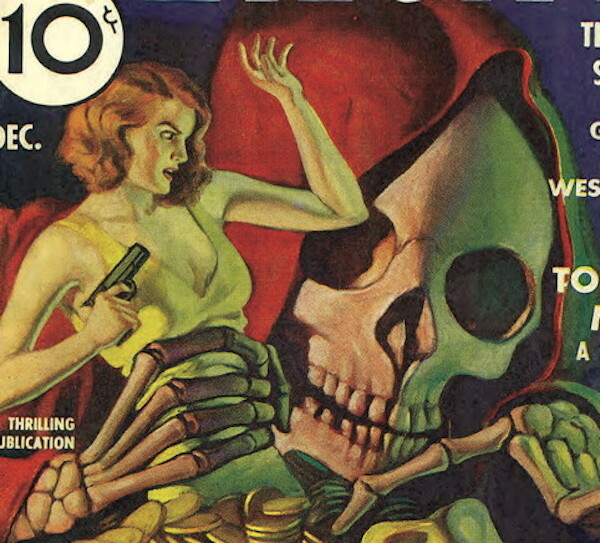 On the classier side, the skull and rose art for Ian Fleming’s James Bond novel Goldfinger (1959,) female skull and orchid motif on the 1944 Avon paperback edition of Raymond Chandler’s The Big Sleep and George Rosen’s painting of a nattily clad cadaver fronting the July 1942 issue of The Shadow are beautifully rendered revelations. If boney brain boxes are your thing or you’re looking for inspiration for that next tattoo or band logo, collect pulp illustration, this full color title will suit you just fine. 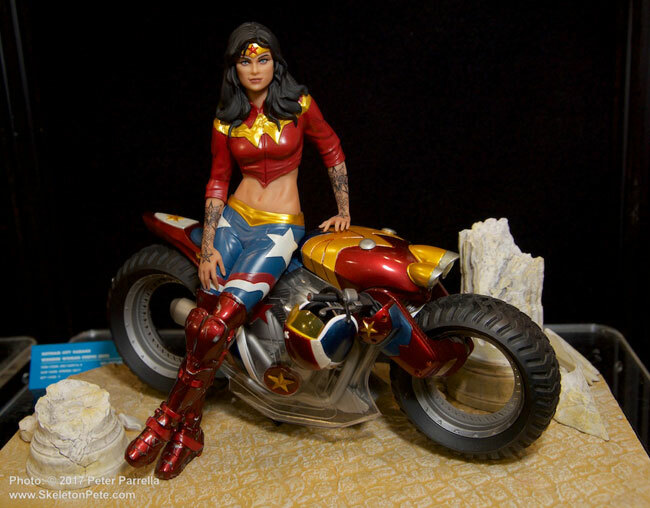 $19.99 puts this hardcover on your bookshelf. If you are looking for even more skull-tural edification I suggest Dover Publications recent A Century of Skeletons. Published to commemorate the 100th anniversary of the passing of José Guadalupe Posada, Mexico’s preeminant artist of the calavera, it makes a great visual companion to Popular Skullture.